The objective of a Green Investment Property is to increase the property owners net operating income by implementing energy efficiency and renewable energy initiatives. If you are a building owner, developer, REIT ( Real Estate Investment Trust ) or a property manager sustainability can and should be an added source of profitability for you. Investment Property owners need a specialized Green partner to help them identify, simplify, and execute energy initiatives in order to take action against rising energy costs, increase net operating income (NOI), and strengthen their brands. A green team of experienced advisers can provide pragmatic, credible, and unbiased professional services to help companies make smarter energy decisions. By greening a property the bottom line goes up by increasing net operating income, occupancy, and building value. Their are many lucrative and timely financial incentives available to fund green projects. Government & Utility Incentives, Business Loans, Leases & Power Purchase Agreements & Property Tax Financing are just some of the funding tools available to property owners. 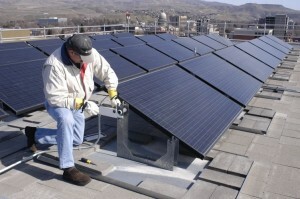 The key is to have a green energy advocate working with the property owner to sort through the available incentives. Property owners need to start with a comprehensive approach to energy management and review existing energy use, reduces consumption through energy efficiency, and generates renewable energy. All these initiatives deliver a clear business case with strong emphasis on the property owners bottom line. A review of energy use is typically done as a commercial energy audit. This audit will review the building current energy use and discover important ways to improve energy use. A detailed review of utility bills and rates, solar feasibility studies, energy efficiency opportunities and financing and incentive options all would be looked at in a commercial energy audit. As part of an audit concrete steps need to be provided to building owners to reduce energy consumption. Energy costs can be reduced by changing both building and behaviors. Typical systems and recommendations that will be looked at are Building controls and EMS, HVAC & Mechanical, Building Envelope, Lighting as well as business process and employee behavior. Any quality audit will also provide alternatives to generate distributed renewable energy. This will look at how to best make energy on site from the sun, wind or earth. PV Solar ( electric), Solar Thermal ( hot water), Small Wind & Geothermal will all be alternatives for real estate investment property owners to consider based on their locations and incentives available. If you are the owner of one of the following property types Office, Multi Family, Industrial, Retail, Shopping Center, Hospitality, Vacant Land, Senior Housing, Health Care, Sport and Entertainment, Special Purpose contact us at 312.433.9300 x 20 for a FREE Consultation Energy of how to achieve profitable sustainability for your investment property. We can also assist investors on green investment property acquisitions in markets throughout the nation through our network of green investment property brokers. In many areas of the country where foreclosure and HUD homes are more prevalent there is much opportunity to shift many of these homes to green properties as some have needed repairs that can be somewhat offset by tax incentive and credits for energy efficient remodeling many of which have been extended into 2012. Even if property owners are not planning to use the property themselves and take advantage of lower energy cost the demand for green construction is growing and is an excellent selling point for today’s demanding buyers.